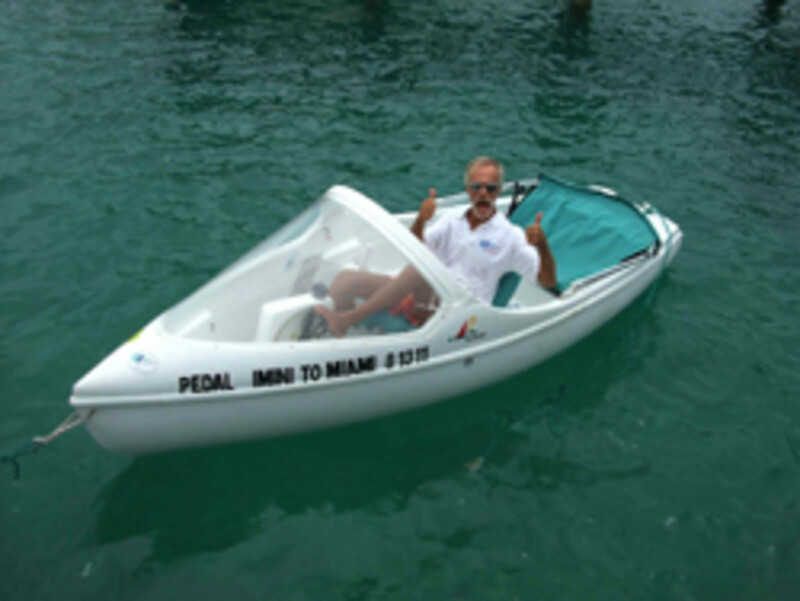 If not for a violent thunderstorm, Bill Boes from Stuart, Fla., would have completed a record-setting journey by pedal boat from Bimini across the Florida Straits to South Florida. The epic journey, which started early Saturday morning from the Bimini Big Game Club in Alice Town ended abruptly that evening when Boes, just a few miles from Pompano Beach and victory, was hit head-on by a savage thunderstorm. “It got worse and worse,” said Boes, who had pedaled for hours in the boiling sun across the Straits to within just 10 miles of his goal. “I thought I would lose it,” he said. battling arthritis, would have become the oldest person to cross the Straits of Florida by pedal boat. Record non-withstanding, Boes’ goals were to raise awareness for human-powered vehicles and money for the House of Hope, which provides food and services to the needy in Martin County, Florida. To learn more about Boes and to support the pedal challenge, go to the Facebook page Pedal to Bimini or call Debra Scott at (561) 318-1271. Click here for a TV news report.